I brought my daughter two pairs of crocs for the summer this morning at Rue La La. If you previously signed up with Rue La La and are still looking for a way to make use of your FREE $20 credit that I posted about here (no longer available – and if you did get the $20 credit, today is the LAST day to use it! 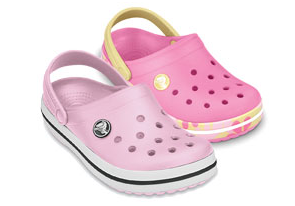 ), you may want to check out the new “Crocs” sale!